Brandon Flynn explains that when we don't intervene, we too become bullies. 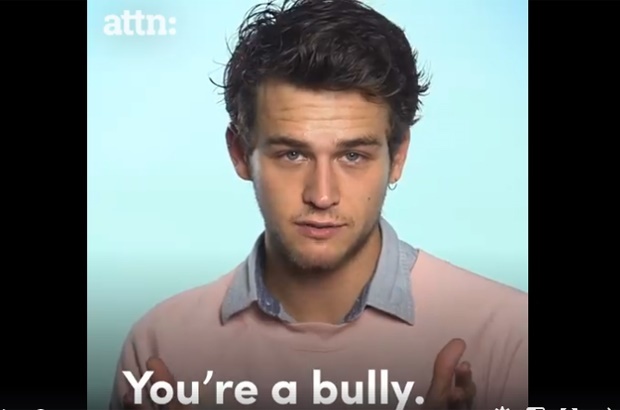 “You’re a bully and so am I,” opens Brandon Flynn in a video explaining that when we stand idly by and watch others get bullied, we too become bullies. Also read: Bullying and suicide: What’s the connection? The 13 Reasons Why star – whose character in the Netflix show bullies and watches as others bully Hannah Baker, the central protagonist who takes her own life – explains that we all can and should stand up for victims of bullying to escape the very title of bully. And while his undoubtedly blunt sentiment may offend you, perhaps we should take a second and consider what he’s saying. When we stand by and watch someone hurt another human being, we may not be the one directly inflicting that harm or pain, but if we don’t stop it either, surely then we are still facilitating, or rather, allowing it. The point is, it’s still happening, someone is still getting hurt, and it’s because we’re letting it happen. Just as a bully chooses to actively throw a punch, quite often we choose not to stop it. We choose to let it happen. In the video below, Burger King showed how, when they staged a scenario in which a high school senior bullied a junior, only 12% of customers stood up and said something. As we can see in the video and as Brandon explains, when you intervene, “the bullying stops within 10 seconds 57% of the time.” How can we not stand up and say something? In another video, a mom explains how her son was getting bullied at school every day and eventually took his own life. She says that after her son had passed, when it was just a little too late, many people sent the family letters explaining what a light he was in their lives. He meant so much to so many people and he mattered more than he knew. She sheds light on the fact that saying something to a victim of bullying could make all the difference and standing up for them can go a long way. WARNING: This video may upset some users. So have you taken a second and considered what he’s saying? Have you considered whether or not you might actually be a bully? Bullying: What more can we do to stop violence in our schools? Bullying: "It's the teachers' responsibility"
What have you done in the past to stand up to a bully? How have you approached a situation in which you've witnessed someone getting bullied. Tell us by emailing to chatback@parent24.com and we may share it with our readers.